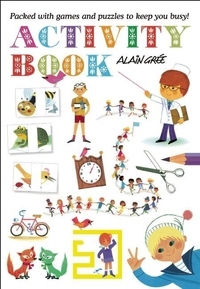 Packed with over 50 activities compiled by Alain Gree himself using a huge number of his illustrations created over the years, the Alain Gree activity book will keep a child busy for hours on end. The activities include spot the difference, matching games and mazes as well as activities involving cutting out, folding and creating objects. Each page of the activity book is printed single-sided and also glued rather than stitched allowing the pages to be removed and displayed.